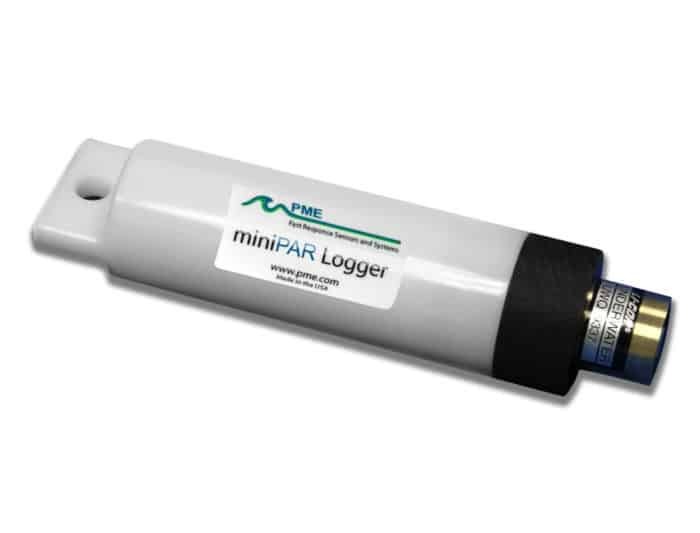 The miniPAR logger is a portable, submersible instrument for measuring diffused sunlight through water, or PAR (Photosynthetically Active Radiation). The miniPAR also contains a tilt sensor to ensure proper orientation, as well as a temperature sensor. Data are recorded on an internal SD card. The miniPAR is powered by 2 AA batteries and can be fitted with an anti-fouling miniWIPER to protect long-term data accuracy. The miniPAR is fitted with a LI-192 Underwater Quantum Sensor, manufactured by LI-COR. The sensor uses a silicon photodiode and glass optical filters to create a uniform sensitivity to light wavelengths in the 400-700nm range. It measures PAR from all angles in one hemisphere. PAR is a key indicator for understanding nutrient loading, photosynthesis, algae blooms, or other biological, chemical, or physical processes. The miniPAR is internally powered by 2 user-replaceable AA batteries. At a sampling interval of one minute, PME is confident that the logger can continue collecting measurements for over one year before the batteries need to be replaced. For long deployments, PME recommends use of an anti-fouling miniWIPER, which protects data accuracy by cleaning the sensor at regular intervals. The miniPAR is constructed from strong Delrin plastic that does not easily crack or break. The miniPAR is unique among similar loggers in that it contains a tilt sensor to measure the orientation of the device. Since PAR measurement accuracy is dependent upon the sensor being pointed toward the water surface, the tilt sensor will alert the user if the sensor is rotated in a particular direction. PME software is provided with every miniPAR logger, and can be found on the included SD card when it is connected to a computer. The software creates visual plots to easily read PAR measurements and allows the user to set the internal clock and sample rate.